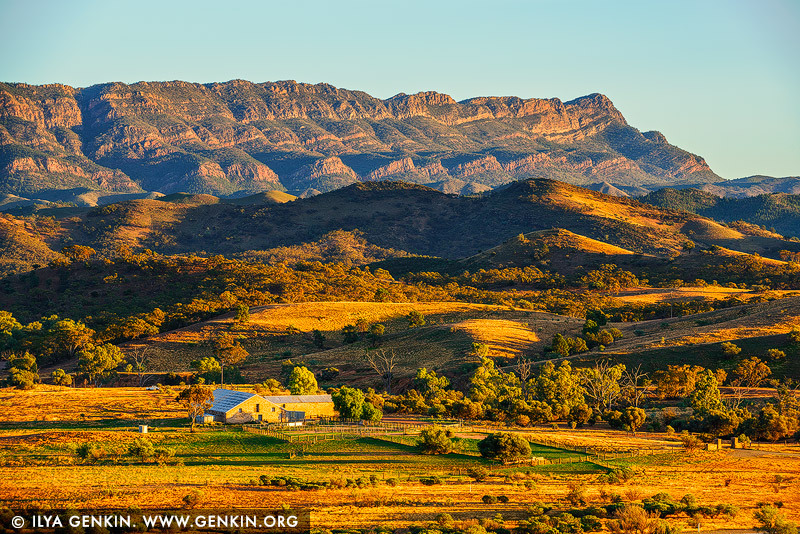 Arkaba Station is located in the Flinders Ranges, which is known as an ancient landscape in Australia. There has been hundreds of millions of years of geological activity which has moulded the area and has spectacular outback scenery. Arkaba is based on a 60,000 acre sheep 'station', its craggy sandstone bluffs and dry creek beds lined with River Red Gums are part of the typical Australian scene, while the geological amphitheatre of Wilpena Pound lies on the northern boundary of the property. Arkaba Station was once a sheep station but is now home to a charming homestead and an eco glamping experience where you can get up close and personal with some of our native flora and fauna. This image belongs to the travel and nature stock photo library. This stock photo of Arkaba Station at Sunrise is available for licensing for commercial and editorial uses including websites, blogs, books, magazines, brochures and advertising. Restrictions may apply for images which contain third party copyrighted material or sensitive subjects. Photos of artwork are for editorial use only. This image id AU-SA-FLINDERS-0021 of Arkaba Station at Sunrise, is copyrighted © by Ilya Genkin. This is not a public domain image.